I want to play, don’t YOU???? I had fun playing with this project and who wouldn’t? My bed as a little girl hung from the ceiling and swung. Yes, I had my dad wrapped around my little finger. This lucky Grandmother has eleven grand children and her children (the parents) to go with them. This was a cabana/guest house that just wasn’t sufficiently equipped to handle a brood of that size. The youngest of the children was in utero and the oldest was 12. That being said, I had to consider all of their needs and being a child at heart I first had to tackle the fun zone. 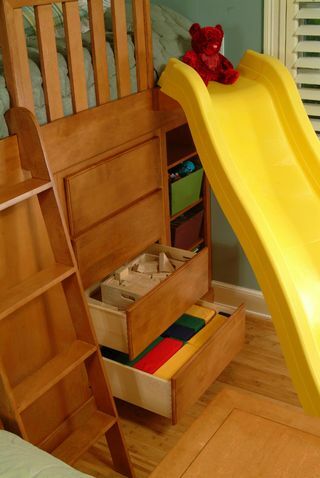 Can you imagine the kid who wakes up in that bed whizzing down the slide to begin his day. 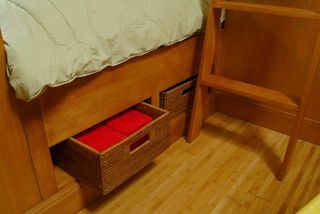 The loft bed is a great design for a kids room because it creates tons of nooks and crannies to store stuff. I believe every play area needs a good set of Crayola Crayons to help the artistic one in the bunch COLOR OUTSIDE THE LINES! 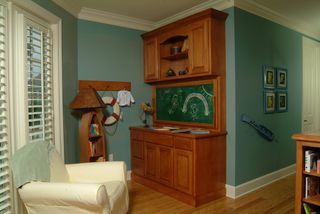 This cabinet has a framed chalk board that folds down and presents storage for art supplies. 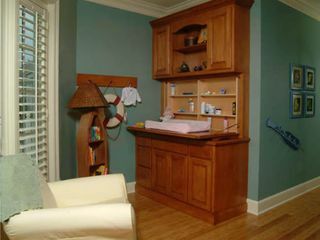 For the babies and the babies yet to come it makes into the perfect baby changer and dresser. This design accommodates all ages to sleep soundly. The parents would find the queen size bed comfortable and the full pull out trundle would work well for any size child and for the wild child the loft bed is a must have.